PROBLEMS For the instant shown, particle A has a velocity of 12. 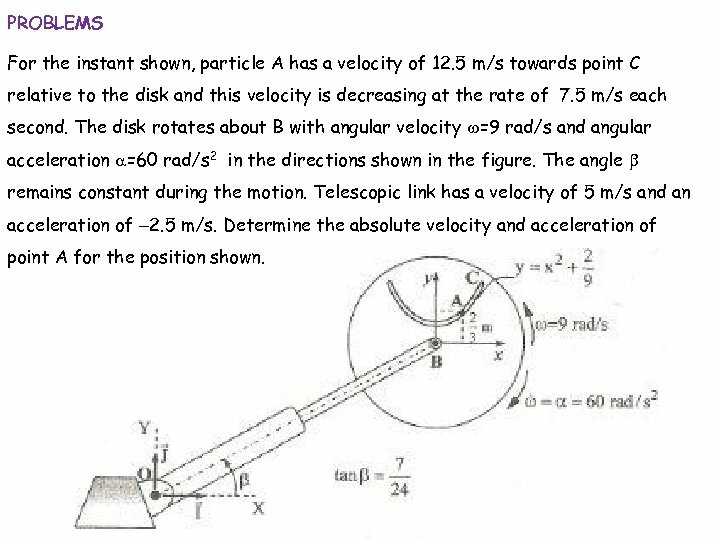 5 m/s towards point C relative to the disk and this velocity is decreasing at the rate of 7. 5 m/s each second. 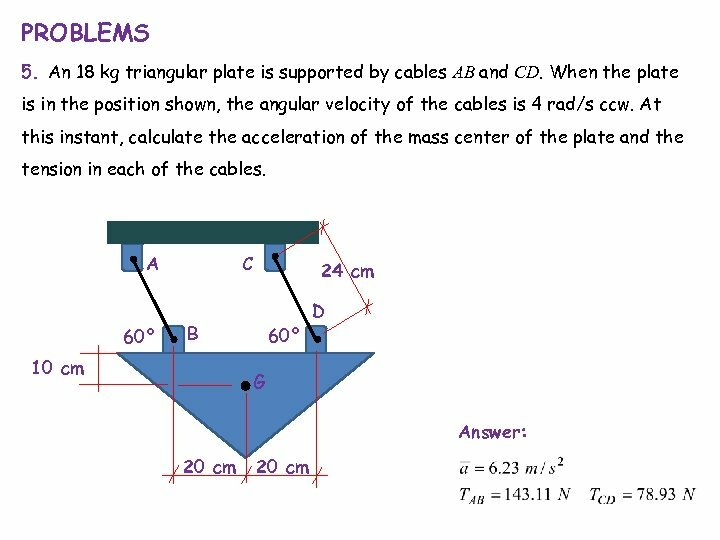 The disk rotates about B with angular velocity w=9 rad/s and angular acceleration a=60 rad/s 2 in the directions shown in the figure. 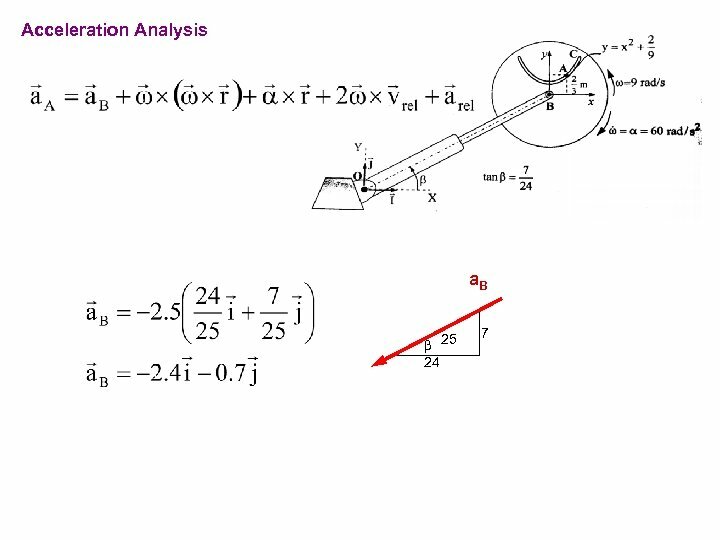 The angle b remains constant during the motion. 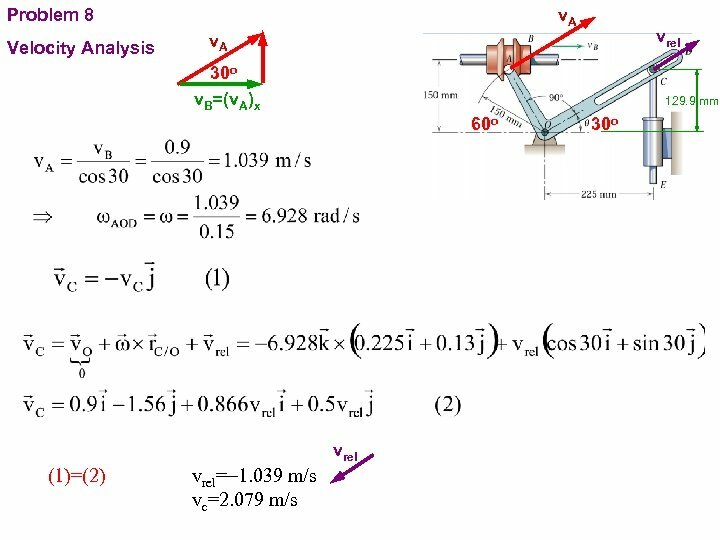 Telescopic link has a velocity of 5 m/s and an acceleration of -2. 5 m/s. 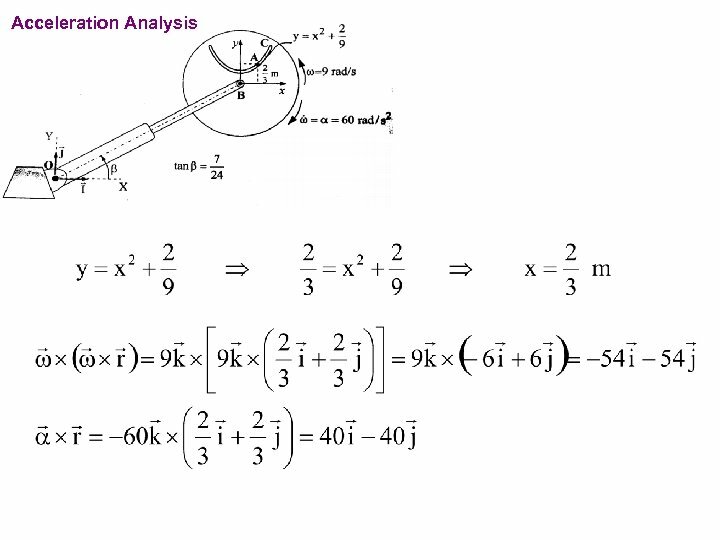 Determine the absolute velocity and acceleration of point A for the position shown. 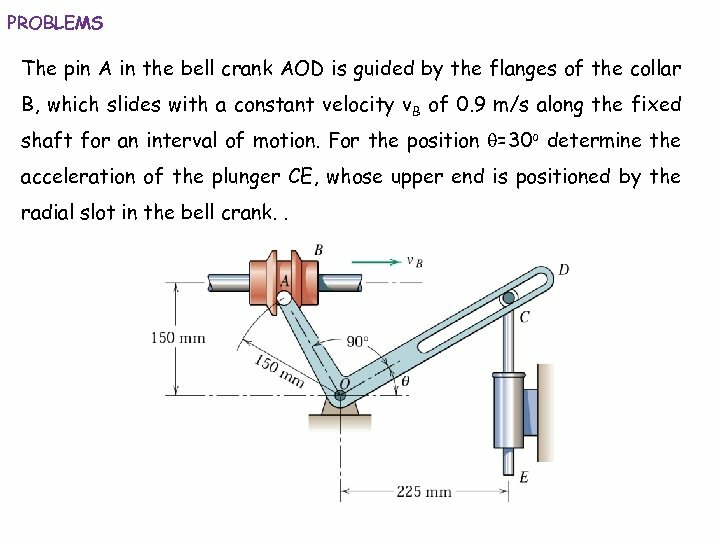 PROBLEMS The pin A in the bell crank AOD is guided by the flanges of the collar B, which slides with a constant velocity v. B of 0. 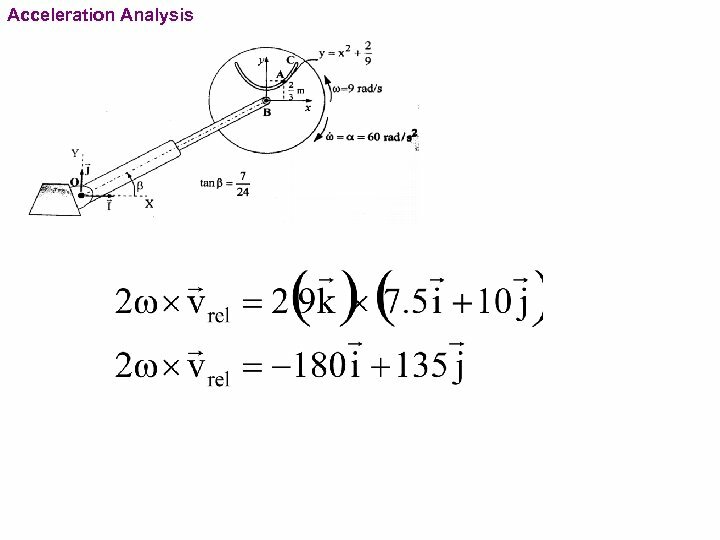 9 m/s along the fixed shaft for an interval of motion. 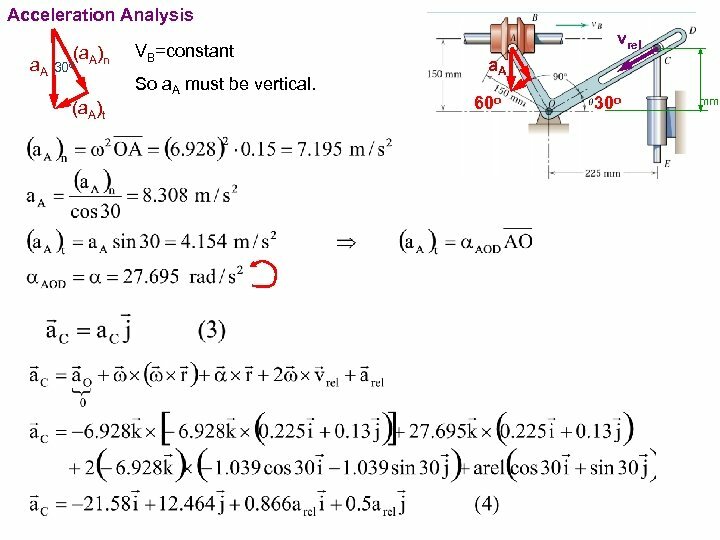 For the position q=30 o determine the acceleration of the plunger CE, whose upper end is positioned by the radial slot in the bell crank. . PROBLEMS 1. 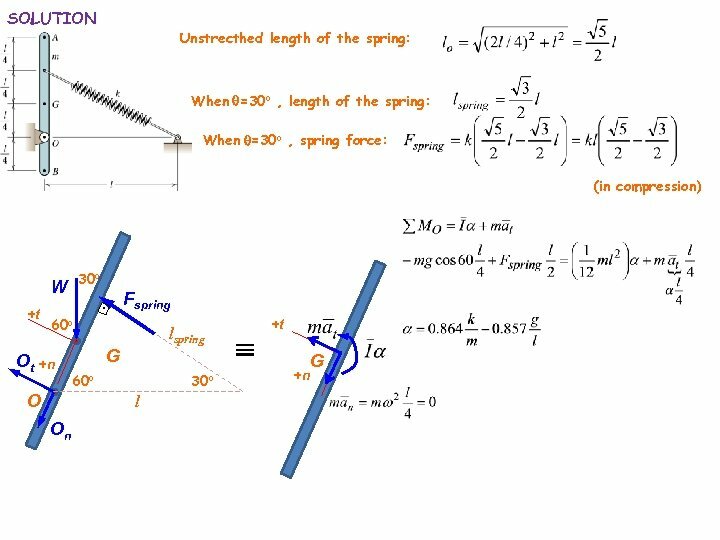 The uniform 30 -kg bar OB is secured to the accelerating frame in the 30 o position from the horizontal by the hinge at O and roller at A. 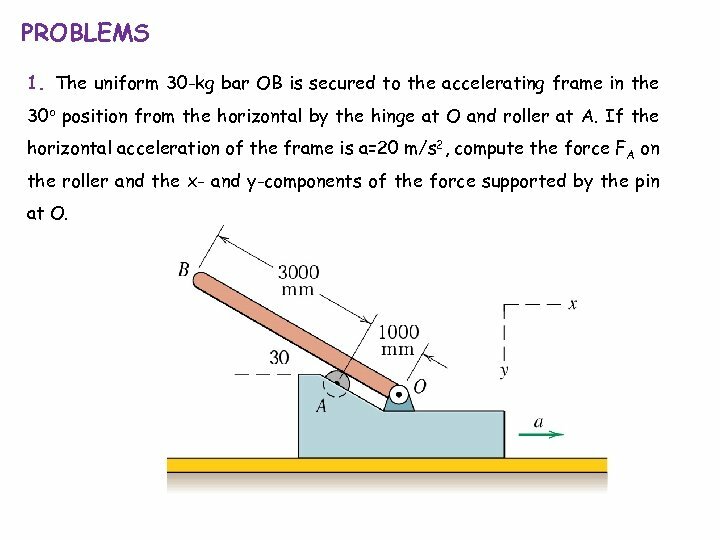 If the horizontal acceleration of the frame is a=20 m/s 2, compute the force FA on the roller and the x- and y-components of the force supported by the pin at O. PROBLEMS 2. 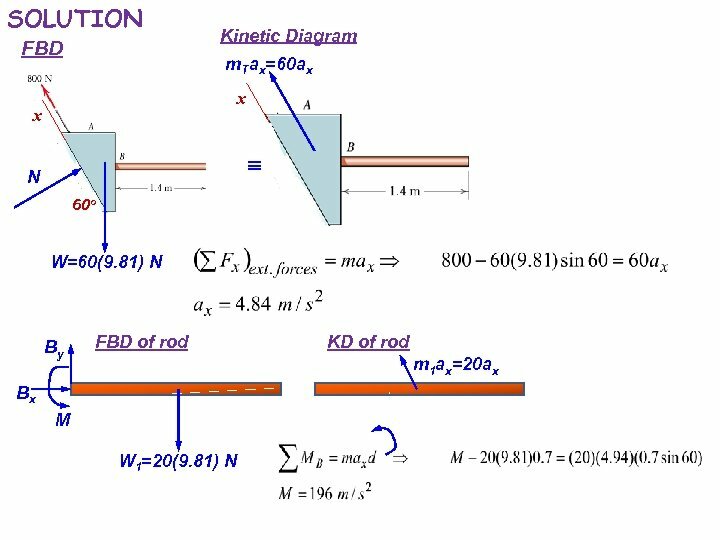 The block A and attached rod have a combined mass of 60 kg and are confined to move along the 60 o guide under the action of the 800 N applied force. 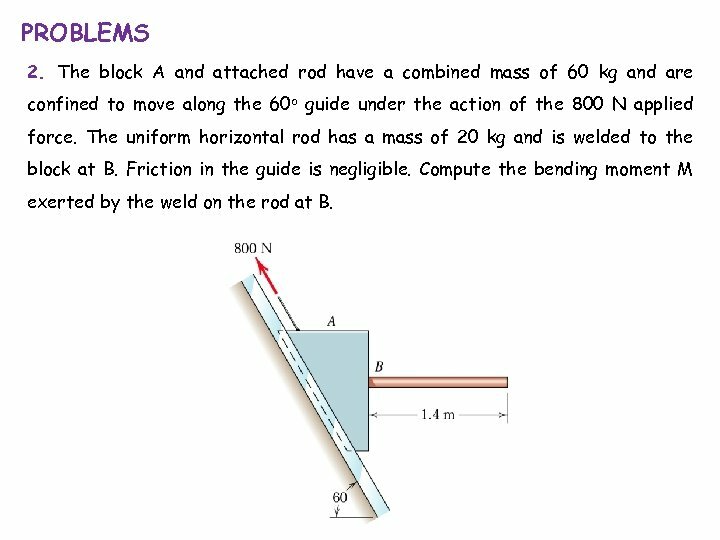 The uniform horizontal rod has a mass of 20 kg and is welded to the block at B. Friction in the guide is negligible. 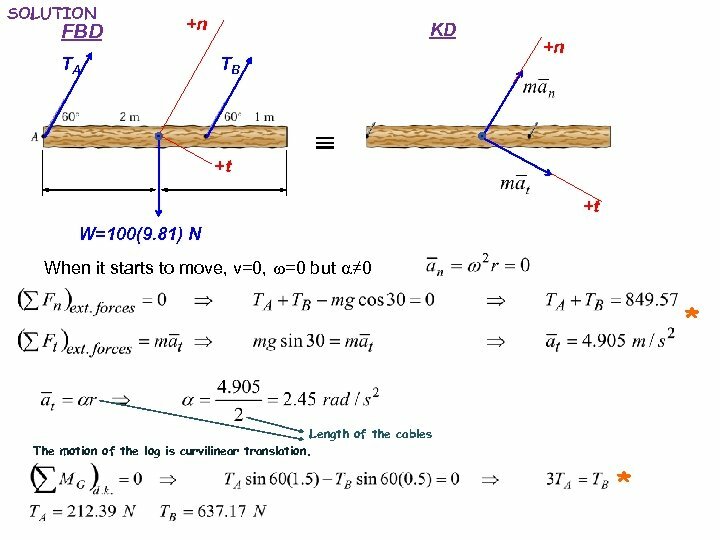 Compute the bending moment M exerted by the weld on the rod at B. 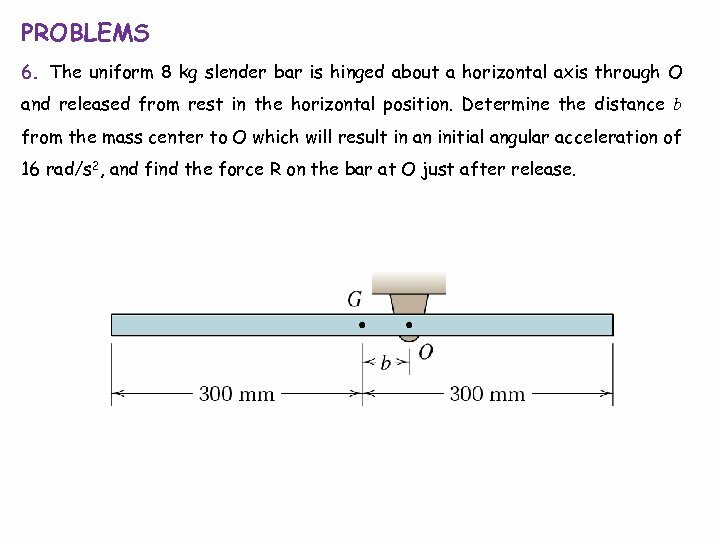 PROBLEMS 3. 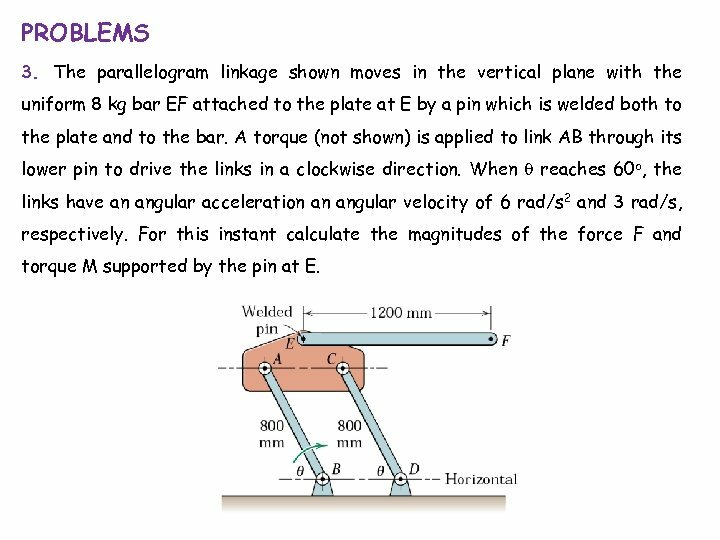 The parallelogram linkage shown moves in the vertical plane with the uniform 8 kg bar EF attached to the plate at E by a pin which is welded both to the plate and to the bar. 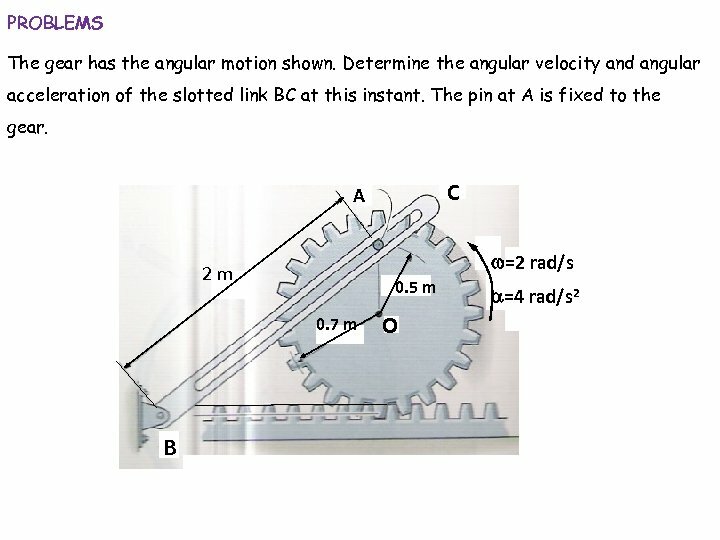 A torque (not shown) is applied to link AB through its lower pin to drive the links in a clockwise direction. 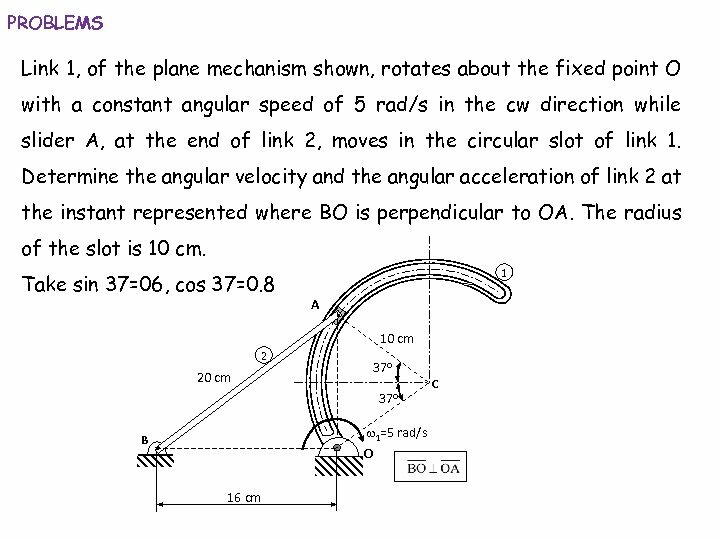 When q reaches 60 o, the links have an angular acceleration an angular velocity of 6 rad/s 2 and 3 rad/s, respectively. 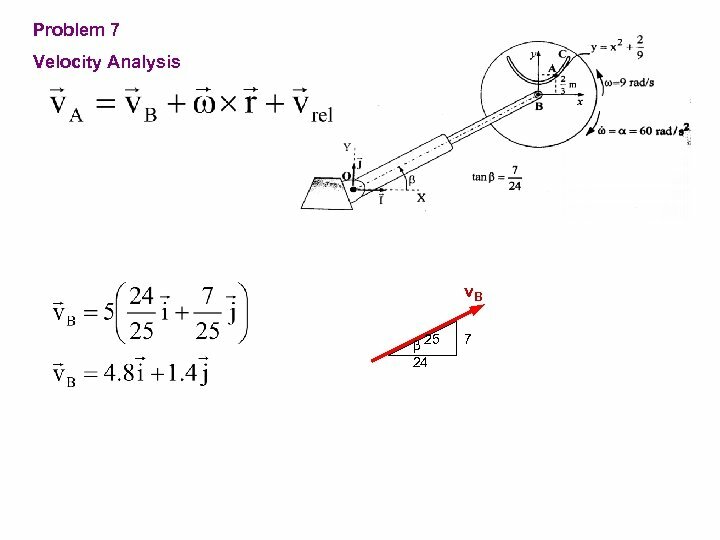 For this instant calculate the magnitudes of the force F and torque M supported by the pin at E.
PROBLEMS 4. The uniform 100 kg log is supported by the two cables and used as a battering ram. 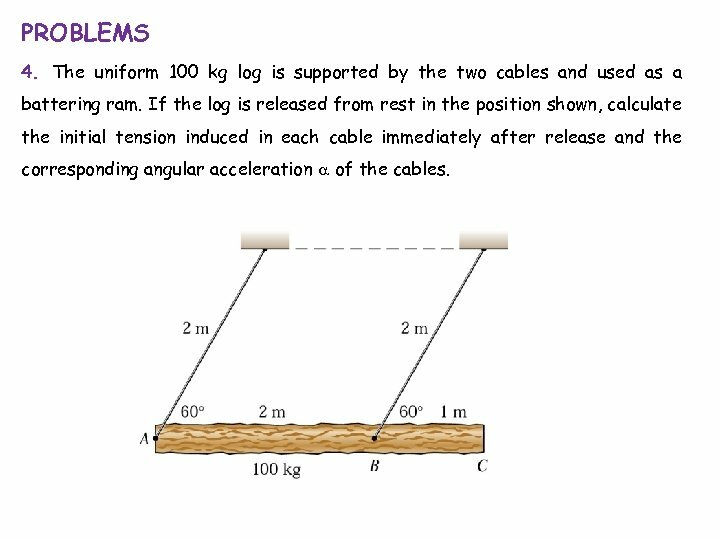 If the log is released from rest in the position shown, calculate the initial tension induced in each cable immediately after release and the corresponding angular acceleration a of the cables. 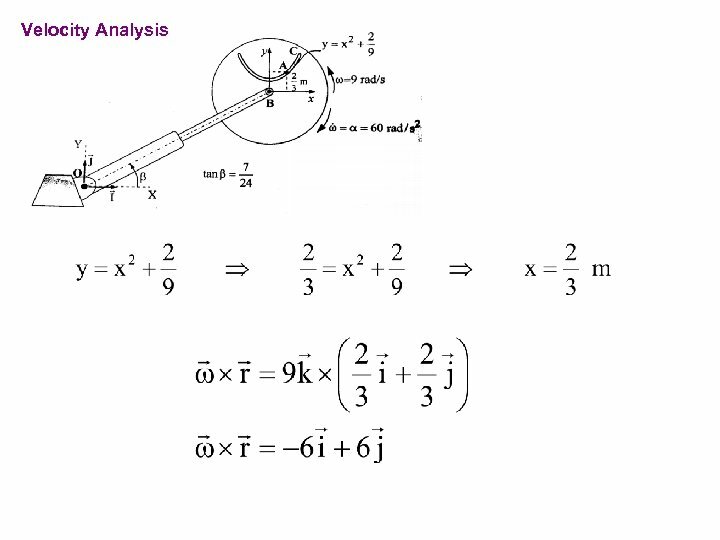 PROBLEMS 6. The uniform 8 kg slender bar is hinged about a horizontal axis through O and released from rest in the horizontal position. 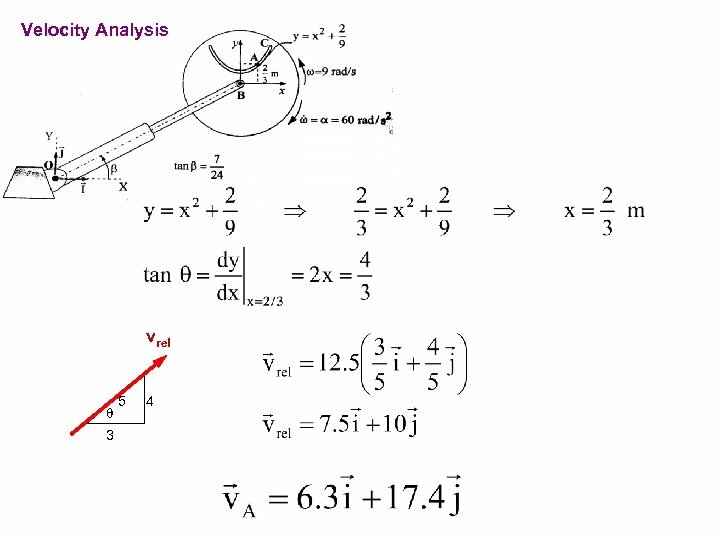 Determine the distance b from the mass center to O which will result in an initial angular acceleration of 16 rad/s 2, and find the force R on the bar at O just after release. PROBLEMS 7. 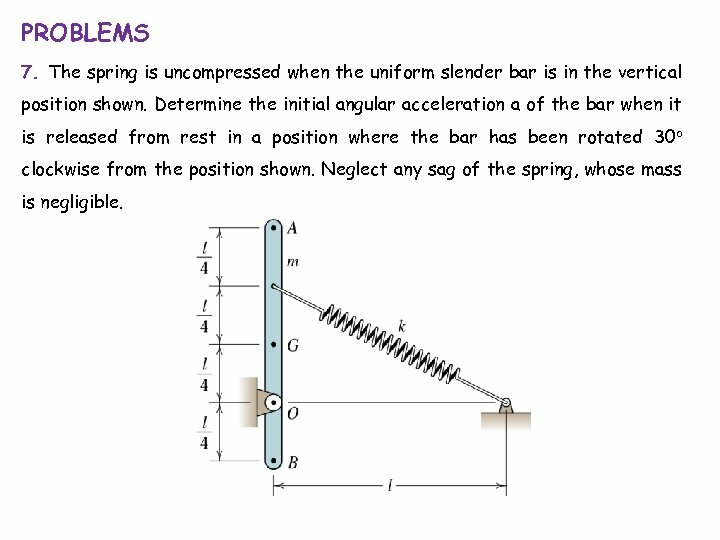 The spring is uncompressed when the uniform slender bar is in the vertical position shown. 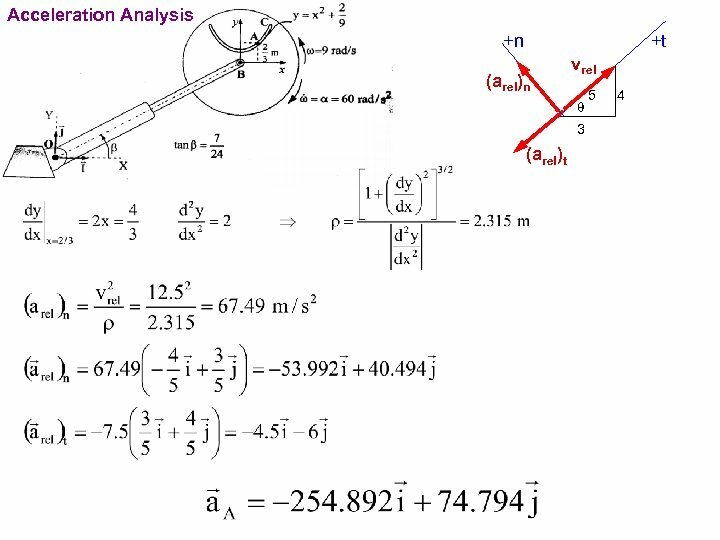 Determine the initial angular acceleration a of the bar when it is released from rest in a position where the bar has been rotated 30 o clockwise from the position shown. Neglect any sag of the spring, whose mass is negligible.